For the pilot program we decided to measure “on time delivery” as a proxy for customer satisfaction; that is, did the customer get the steel on the day we promised it? …. We didn’t know whether to laugh or cry when the first measurement showed that ….. 53% of the step was delivered on time. Shocked, we decided to feature on-time delivery as a significant part of a new bonus system, allowing branch managers and their people to earn up to 25% of their bonus for on-time delivery. What kind of results showed up? Did treating human beings as purely economic beings yield a step change in one-time delivery? To our delight the results started to improve immediately, climbing quickly to 75% across the system, and some branches even headed into the 80-90% range. We had hardly finished congratulating ourselves … when one of the senior team had a disturbing experience. While walking through a branch, he overheard a salesman on the phone to a customer. “We can’t get it to you on Tuesday,” said the salesman. “How about Friday?”……. The executive saw the salesman go back to the on-time delivery screen and record the new promised date as Friday ….…. Further investigations revealed that the improvement in on-time delivery that had earned bonus for all was largely an illusion created by our people, who gamed the quirks in the measurement system. The actual delivery processes in the organisation remained unchanged, and the customers were seeing no difference in our performance. Our analyse-think-change approach had rendered the organisation mindless by focusing exclusively on outcomes and ignoring processes…. “See-Feel-Change”: A More Effective Approach to Organisational Change and “Total Customer Satisfaction”? 1. Salespeople promised the steel early so that they could get the order. 2. The credit department could not approve the credit in time. 3. The processing department couldn’t make the schedule. 4. The quality of the product was not up to standard. 5. We were unable to locate the product in our inventory. 6. The trucks were unable to deliver on schedule. 7. A third party (usually a steel mill) let us down. Take a look, a deep look, at these reasons. What do you see? I see issues in the product, in the manufacturing of the product, in the management of the inventory, in sales, in finance, in logistics….. In short, just about every function in the organisation is involved in the work that has to come together in order to generate “total customer satisfaction”. We formed teams to look at each of these reasons and to search for the systemic causes behind them, drilling down into the bowels of the system. Reason 1 was no surprise ….. the disconnection between sales incentive schemes and factory production systems is a major obstacle to effective performance. Reason 2 (credit delay) did surprise us -surely credit approval was a mechanical, by the numbers job,. How could it be a major source of delay? ….. investigation revealed that the problem lay with the large number of smaller orders. Now small orders were part of our overall strategy, and for years we had encouraged the taking of smaller orders… Margins on small orders were high, so, as far as we were concerned, the more we had the better. …. another team working in the warehouse on reason 3 (production delay) found that the primary cause of production delay was the time spent waiting for cranes. After another investigation a team of warehouse people found that the main reason was …. small orders…….. Management was stunned – our small order strategy had been an article of faith throughout the corporation. Yet here it was creating a fundamentally unprofitable operation for systemic reasons that we had never understood. Now, the reader may feel that management must have been asleep at the switch to miss something as obvious as this. However, the logic of complex systems is neither obvious nor intuitive, and it becomes clear to us only in hindsight. Even then it was the people who worked in operations every day who had to point to us that the real cost drivers on the warehouse floor are finding and handling the product. It’s a common problem in large organisations. The people on the front lines have all the answers, but senior managers seldom ask them the questions, at least in a form … that they can understand. How does David K.Hurst end his story? What does he conclude? We had experienced the benefits of drilling deep down into operations, into the processes that produced the outcomes that we were trying to change. John Kotter calls this kind of change “see-feel-change”. That phrase neatly captures a sensual aspect of change – you see a truth and it changes how you feel – it is timely, specific, visceral feedback. Also, it’s compelling for other operators to see it because they can study the action required at the fine grained levels at which they are going to have to implant the changes in their own operations……. First, you go deep on a narrow front, and only after that do you go horizontally, rolling out a program in depth from unit to unit….. This perspective also suggest that huge benefit of pilot programs that develop working prototypes of how a proposed change will actually function…. What is my take? David is sharing and advocating the road less traveled. It is less travelled because it is not quick. It is not cheap. And it is not painless. Yet, it occurs to me that this is the road that has to be travelled to generate the insight-motivation-action that is needed to effect deep change in the behaviour of the organisation. And shift it towards generating-delivering “total customer satisfaction”. What Is The Context For This Conversation? I am following the lead taken by Dawna MacLean in her recent post on encouraging businesses to become more human. It occurs to me she is a brave lady worthy of admiration and respect. I dedicate this post to her, in service of the stand she is taking and the possibility that she is living from and into. There are many actions that I regret. Few bring me shame. One in particular is etched within me despite it occurring ‘a lifetime ago’. I reckon I was 14 at the time, walking, alone, on my way into the town centre. I am stopped by an old lady, she has a walking stick, she tells me she is lost, she asks for directions. I draw closer to hear-understand what she is saying. She smells! I tell her that she need to turn around. I tell her she is only ten minutes walk from her destination. And I spell out the directions – twice. A voice speaks to me along the following lines: “Take her hand, walk her there, it is even on your way somewhat. Without your help she will struggle.” Another voice speaks: “She smells awful! You are in a hurry and it will take ages to take her there. You have given her what she asked for. She’ll be fine.” I listen to the second voice, leave her to make her own way, and I walk into town. I cleaned up a lot of history whilst participating in Landmark Education. And that is one that I never got to clean up. If that old lady were here today, I’d ask for her forgiveness. Why am I sharing this with you? So that you have the context from which to make sense of what I speak-write. I write is not to help you make it: sell more, be more successful, obtain higher status, live happily ever after. I write to open eyes, unblock ears, touch hearts. I write to encourage-facilitate a shift of worldview. I write from the possibility of meaningful-fulfilling human lives and the possibility of a ‘world that works for all, none excluded’. Arguably a world that works must include meaningful-fulfilling human lives. And such a world has plenty of space for businesses that do great by doing good: enriching human lives, and life as a whole. What Is The Experience That Goes With Transformation? The last post ended with “So the challenge of Customer Experience is the challenge of a transformation in worldview.” When I speak transformation, what am I pointing at? Look at the following picture, keeping look at it until a shift occurs in what you see. What occurred? 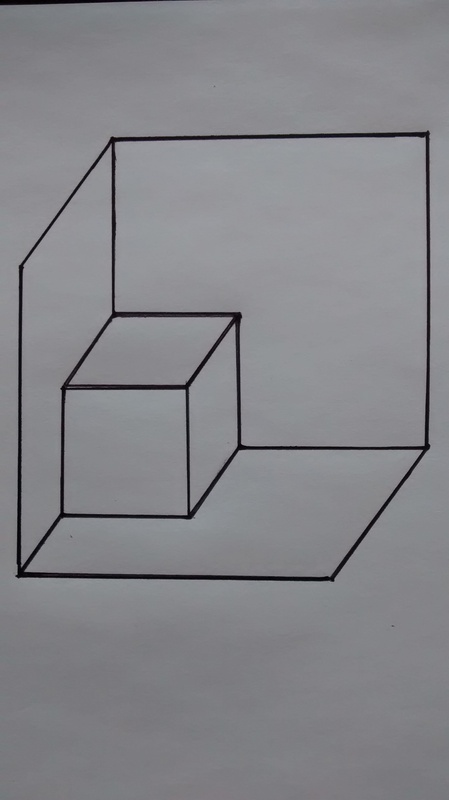 If you are like me then you probably started out seeing a small cube sitting inside of a an ‘open box’ and then came a moment when you saw a big cube from which a small cube (left hand corner) was cut-out, missing. Please notice, the reality (that which is) has not changed. It is the same picture – nothing about the picture itself changed. Yet, that which you perceived-saw changed and you had something like a surprise: an ‘aha’ experience. Why? Because the perceptual switch that occurred was not simple a change-adjustment-variation of what you saw originally. What you saw was distinct from what you had seen earlier. Put differently, a transformation occurred in your seeing. What can we learn from this? Given the same ‘that which is so’ you made sense of it in two distinct ways. And, this is important, each way of seeing ‘that which is’ occurred as natural, correct and absolute whilst is was occurring the way it was occurring for you. Only by looking at the picture for a sufficient period of time, in a specific manner, did the gestalt like shift in your seeing occur. And when it did occur, it occurred in an instant. Transformation is like that. Now think of business and organisational life and apply that which you have experienced here. And learned. Ask yourself this question: is the way that the business world is ‘pictured and talked about’ the only way of picturing and talking about it? Is it possible that there are many ways of picturing, talking about, and showing up in the business world? I say that there are numerous ways of seeing-interpreting the business world – that the number of ways is only limited by our imagination AND the influence-strength of the dominant paradigm of seeing. Let’s take a brief look at each in turn. Risk management given that every customer has access to a smartphone and social media and thus is in a position to damage brand-corporate reputation. The goal of business within this dominant paradigm is that which it has been since the ascendency of shareholder value and ‘greed is good’ ethos. This goal is characterised by a focus on self (oneself and one’s tribe), and greed: to extract as much value as possible in the short-term. Any value created for the customer is the minimum that it is necessary to create in order to extract as much value for ‘Self”. Within the dominant paradigm, CRM (including social CRM) is simply a technology that is used to augment-strengthen the existing business logic: getting as much money out of the customer as possible whilst giving away the minimum; and getting as much value (productivity) out of employees whilst giving back the minimum. Finally, in this model (as practiced) the deep business logic stays the same. Competition rather than collaboration. Self at the expense of others. Efficiency rather than effectiveness…… Importantly, people are neither trusted nor treated with respect and accorded the dignity that goes with being a full human being; threat, fear, and game playing are pervasive. In this model Customer Experience is a subset of Experience. Experience encompasses the experiences of all the participants-actors-stakeholders: customers, ‘partner’s (the people who actually work in the organisation and create value for customers), value chain partners (suppliers, channel partners, outsourced partners…), and the community. The ‘Goal’ of the business within this paradigm (way of seeing the world of business) is one of creating value for and sharing this value with the whole system (all the participants, all the stakeholders). Such a business is focussed on making a contribution and serving: enriching the lives of all participants. And usually takes a stand and operates from-into a specific possibility. Take a good look at the John Lewis constitution and you will see the stand and the possibility spelled out. Read Jeff Bezos’ annual letters or Tony Hsieh’s book, Delivering Happiness, and the possibility-stand is clearly articulated. In the model, the business logic of the organisation is designed-operated from the context of creating-generating the kind of ‘Experience’ that is mandated the ‘Goal’. 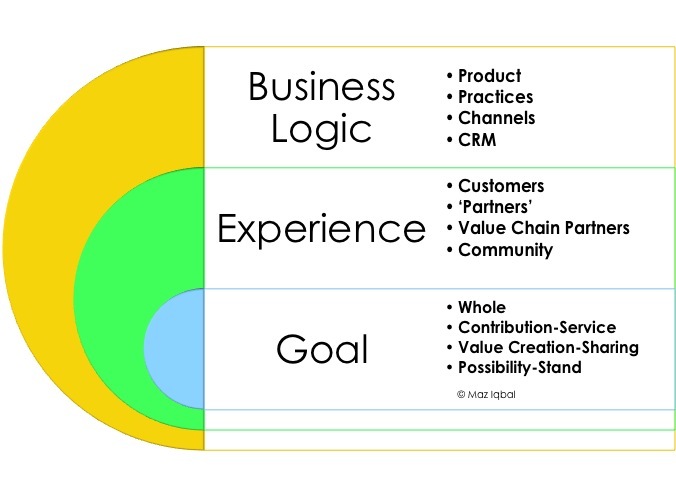 Put differently, the ‘Business Logic’ now serves as the means of delivering the Experience. Not the other way around. Put differently, ‘Experience’ precedes’ Business Logic’. From where does the design of ‘Experience’ flow? From the ‘Goal’. Remember the goal is to cater for the needs-welfare of the whole. Which is why ‘Experience’ encompasses all the actors, all the stakeholders. In this way of looking at the world of business, and according to me, Customer Experience takes it’s rightful place. Rather than dominating the discussion, Customer Experience is seen for what it is, just one component whose meaning-impact comes from how it fits into the other components of Experience. And how it gives life to the ‘Goal’. 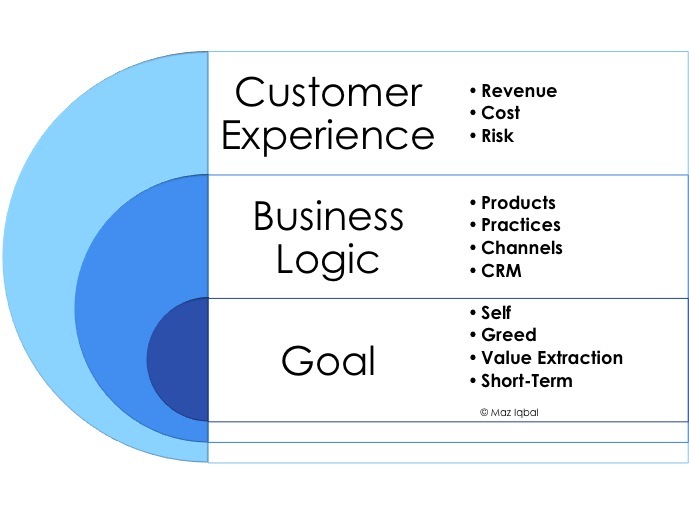 What becomes of CRM in this model? CRM systems are simply tools to give life to the ‘Experience’ that the organisation is committed to creating-generating. As such CRM systems must take into account the needs of Customers and ‘Partners’ (people who will use the systems) and deliver the kind of experience(s) that these folks are looking for. Enough for today. I may elaborate on these models in the future. If you find yourself moved to share your thoughts then I invite you to do so. Leadership / Performance: Are You Committed To Something Bigger Than Yourself? Is There Anything Bigger Than The Maximisation Of Shareholder Value? According to Roger Martin, the third most influential business thinker in the world according to Thinkers50, the shareholder value maximisation revolution was triggered in 1976 by Michael Jensen and William Meckling. How? These economists published, what has turned out as the most cited article ever: “Theory of the Firm: Managerial Behaviour, Agency Costs and Ownership Structure”. In this article, Jensen and Meckling argued that the professional managers (running businesses) were looking after their interests at the expense of the shareholders. Thus began the shareholder maximisation movement that has since then taken over the business world. And in so doing, all other stakeholders (customers, employees, suppliers, partners, society at large ..) have been viewed-treated as mere resources and/or means of creating-maximising shareholder value. Are You Committed To Something Bigger Than Yourself? “I have a bad rep on this kind of thing. Because people think that all I want companies to do is to maximise the value of the stock. First of all that is false, it’s not what I ever said. But I guarantee you if you are talking about maximising the right value, which is the total value of the firm, if that is all you’re doing you won’t maximise value! Author Maz IqbalPosted on March 19, 2014 March 19, 2014 Categories Culture, Leadership / Change / Transformation, Organisational DesignTags being committed to something bigger than yourself, leadership, Michael Jensen, ontological-phenomenological model of leadership, performance, Shareholder value, Werner Erhard2 Comments on Leadership / Performance: Are You Committed To Something Bigger Than Yourself?